Be the first to share your favorite memory, photo or story of Isolene. This memorial page is dedicated for family, friends and future generations to celebrate the life of their loved one. 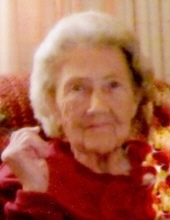 Mrs. Isolene Bass Robertson, 89, of Dunn died Friday, October 19, 2018 at her home. Mrs. Robertson was born April 1, 1929 in Sampson County daughter of the late Royal and Kizzie Dudley Bass. She was also preceded in death by her daughter, Mary Schneider; husbands, George E. Schneider, Alvis H. Page and Lee M. Robertson; brother, Robert Bass; sisters, Mary Lou Watkins and Cecila Manness. Mrs. Robertson was a graduate of Mingo High School and a retired insurance agent with Mid-South Insurance Company. She was a member of Stoney Run Pentecostal Free Will Baptist Church and enjoyed sewing and taking care of her animals. A funeral service will be held 3 p.m. Monday, October 22, 2018 at Stoney Run Pentecostal Free Will Baptist Church with Dr. Preston Heath and Rev. Rick Kelly officiating. Burial will follow in the church cemetery. She is survived by her sons, Edward Arnold Schneider and wife Brenda of Panama City, Florida, Mitchell Franklin Schneider of Surf City and Benny Royal Schneider and wife Janie of Dunn; eight grandchildren, seven great grandchildren and five great great grandchildren. The family will receive friends 2 – 3 p.m. Monday one hour prior to the service at the church and at other times at the home. To send flowers or a remembrance gift to the family of Isolene Bass Robertson, please visit our Tribute Store. "Email Address" would like to share the life celebration of Isolene Bass Robertson. Click on the "link" to go to share a favorite memory or leave a condolence message for the family.